On 28 May 1818, Oxley led another expedition from Bathurst and followed the Macquarie River until it too disappeared into `an ocean of reeds` (Macquarie marshes). From the 6 July Oxley`s party proceeded north-east until they discovered the Castlereagh River, then turning east they found the rich Liverpool Plains, reached and named the Peel River, crossed the southern part of the New England Range near Walcha, found the Hastings River and followed it to its estuary which was named Port Macquarie. 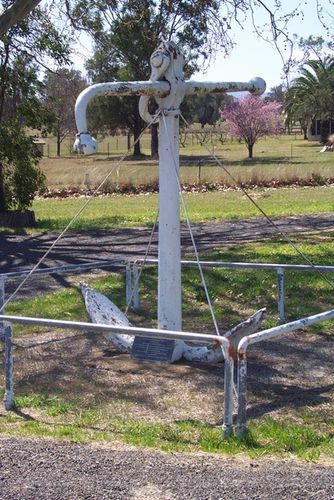 The "Sydney Morning Herald" says that Tamworth is to have a unique memorial to Lieutenant Oxley, the first of New South Wales, who discovered the Peel River in 1818, An anchor of H.M. surveying ship Senlark has been obtained from the Commonwealth Naval Department,- and is to be placed on the Oxley pedestal on Manilla Road, about six miles from Tamworth. The anchor, which has been on Garden Island since the Sealark went out of commission, was landed at man-o'- war steps and conveyed to Darling Harbour railway'station for transport to Tamworth. The Oxley pedestal was unveiled on Sep tember 2, 1918 — the centenary of the discovery of the Peel River by the then Premier (Mr. Holman). Mr. T. G. Adamson, of Mosman, the originator of the Oxley celebration at Tamworth, explained that the spot where Oxley crossed the Peel River, and also his camping place in the Moore Creek Range, had been identified from tho explorer's diary. The pedestal had been erected adjacent to these historic spots, and it had been considered appropriate that an anchor of H.M.S. Sealark, which had carried out important survey work in Australian waters, should surmount the pedestal, as Oxley was an officer of the Royal Navy. The Navy Board had generously given the anchor for the purpose of the memorial, and the secretary of the board had stated that it was thought very approprlte that the anchor included as a memorial to Lieutenant Oxley should also be a relic of one of the survey ships. Lieutenant Oxley, who was appointed a member of the Legislative Council of New South Wales in 1824, died at Kirkham, near Camden, on May 25, 1828. Telegraph (Brisbane), 25 May 1926. This ANCHOR from the H.M.R.N. Survey Ship "SEALARK" was donated by the Naval Board Melbourne as a Memorial to Lieutenant JOHN OXLEY R.N. Explorer Scientist and First-Surveyor General of New South Wales. This Memorial marks the route taken by the Explorer on the 2nd. September, 1818. Obelisk unveiled by the Hon. W. A. HOLMAN, Premier, 2nd. September, 1918.